Phew, Thursday! I was moving a bit slower today due to not getting a whole lot of sleep last night, but it was quite the busy day for me. We picked up discussion from the day before about announcements from Canonical, it was generally agreed that the community is less bothered by announcements which don’t impact them or require them to do a considerable amount of work, or makes work completed feel useless or ignored. It also seems like there may be missed opportunities to get the community involved in improvements. We then discussed the Unity Distilled list proposal, and compared it to the value that separating ubuntu-devel and ubuntu-devel-discuss has brought to the development community. With regard to UDS, I suggested that Canonical reach out to LoCo teams when planning so we can be more engaged. The session wrapped up by discussing UDS sponsorship and timing of announcements for venue and sponsorship, at this point timing-wise the contact for the next UDS hasn’t been signed. They’ll be working to open sponsorship earlier. Generally good feedback about the status of the IRC Team and IRC Council. Quickly went through the process for operator recruitment, it has gone well and they’ve started syncing up calls for operators with the release cycle. They are seeking to clean up some of the access lists to better sync up with the launchpad lists, but won’t make changes where there aren’t problems. The IRCC only has 4 members, they’d like to fill their remaining seat so have added an agenda item to the next Community Council meeting and we’ll get that process started at that time. Reviewed no idling policy of -ops channel and agreed to explore some options moving forward. Wrapped up the session by discussing how IRC is used at UDS, newer versions of etherpad support a chat option which may improve interactions being noticed in the session, tomorrow there is a separate session about exploring this further in summit.ubuntu.com. I’ve uploaded the notes from the session here. The message of the Code of Conduct has changed with the merging of the Leadership Code of Conduct. The main reason we wanted to do this is that we’d rather not like to persist the separation between community members and “Leaders” since we want to encourage all of our community members to strive for and be empowered to take leadership positions as their roles grow. We also wanted to integrate a diversity statement, which is now in this 2.0 version. The session clarified some of the reason for the changes, including protecting leaders (and potential leaders) from non-constructive and sometimes abusive backlash from other contributors when they have to make a tough decision, instead encourages more healthy engagement. We also discussed that we may want to make it simpler to sign, rather than using a PGP key, but still make it some kind of process so it doesn’t become a “Terms and Conditions” type document that people just click through. We also had a lot of great participation in the room to point out some changes we’ll need to make before we send out a more final revision for review, so thanks to everyone who came out and spoke up during the session. My fellow Community Council member Charles Profitt wrote a blog post about the session here. I started off this session by reviewing some of the work we’ve done in the past cycle and will continue to do like Career Days and Full Circle Magazine columns and we brainstormed some about how to keep these going and who we can contact to encourage to participate. An action item was taken to take some of our older Full Circle Magazine posts and start posting them on our blog (with “originally appeared in FCM Issue # in $year…” etc notes). There were also some ideas about how visible the project was on some of the more core Ubuntu resources and within about an hour of our session a note about the project was up on edubuntu.org (thanks Jonathan!). We’ll also be reaching out to projects like OpenHatch and other groups that do very targeted mentoring. Finally, we’ll be taking a look at our leadership structure and electing new leader(s) this cycle. I was sorry to miss the Edubuntu plans for 12.10 and Ubuntu LoCo Council Items for the Quantal cycle sessions due to conflicts, so I’ll have to catch up with notes and participants later. The first plenary session after lunch was on QA and focused on a series of FAQ around Ubuntu Automated Test Harness (UATH) and then a demonstration. Calexeda presentation about some of the facts and challenges of massive scale datacenter deployments, including power, space and cluster management and then noted that hardware hasn’t kept up with the demands of software and data. On the Ubuntu side Calexeda began getting involved at UDS-L in Dallas in 2009 and then Linaro was founded in 2010 to accelerate ARM and Open Source work. In the 11.10 release Ubuntu shipped with ARM support, and in 2012 they are seeking to deliver a complete solution and they anticipate an aggressive adoption of ARM servers and the rate and pace of innovation. The next plenary was on the current state of OpenStack. I saw a talk of the same name at SCALE in January and it was great to see how different this one was post release of Ubuntu 12.04 which shipped with Essex and will have an option to update OpenStack throughout its supported life. A list of known deployments was also shared, which includes HP Cloud, NASA Nebula, Rackspace and private clouds at Sony and Disney. Also reviewed some specific states and goals of the separate pieces of OpenStack. Wrapped up with note that all major Linux distributions have signed up to be founding members of the OpenStack Foundation. The last plenary was about MAAS (Metal as a Service), where there was a quick review of the history of the project and then did a live demonstration. Started off with a couple lightning talks by some of the community leaders. Charles Profitt spoke about Tuckman’s stages of group development. Jorge Castro talked about AskUbuntu governance and conflict handling, since it’s a StackExchange site they go by their “A Theory of Moderation” and they use the Questions and upvotes mechanisms for site policy and even electing new moderators. 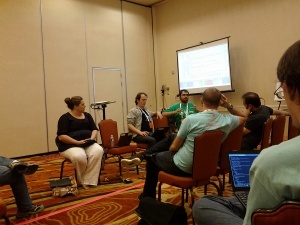 Then shifted into Q&A with the Canonical Community team. Led to a discussion about some of the collaborative meetings the team has, including regular one on ones, a public IRC meeting and some private casual meetings. Then moved into a discussion about the relationship between community and Canonical which led into a discussion about perceptions outside the project about the relationship. We then discussed some of the challenges as the LoCo communities grow and we expand beyond traditional contributors to companies and users with very different needs, motivations and interests. We also asked what other innovations could be made in the community moving forward. After the break we picked up the Leadership Summit by discussing whether there are some core details that community members can focus upon. A proposal was made to get together some “more official” slide decks for some of the generic presentations (new features in $release, introduction to Ubuntu, introduction to getting involved). Leadership handbook was mentioned, the resources are available if someone wants to pick it up. We then continued the community lightning talks. Jono Bacon spoke about team planning and organization strategies. Then discussed some about getting through rough or lonely portions of projects, then on to the Learning team example – good to be clear about goals and expectations and being concise about making decisions. I ended up leaving the leadership summit to attend this session as the Xubuntu representative. We reviewed what the different flavors were already doing application QA-wise and discussed what the flavors teams need QA-wise. The Xubuntu team will be moving our Short and Long tests over to the QA wiki and there is a session Friday I’ll attend on Friday about expanding the isotracker’s test case capabilities. After all the sessions I sat down with Jose Antonio Rey to talk about the somewhat defunct Ubuntu Learning Materials and make plans to move forward so he can get some materials to a teacher of his who wants to teach about Ubuntu in his classroom. I then met up with some folks from the Ubuntu Women Project to head over to my place in San Francisco for an Ubuntu Women Project dinner. 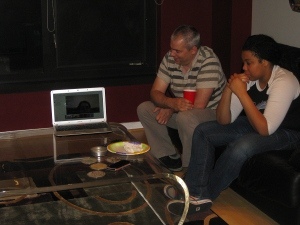 And fired up a laptop with a Google+ Hangout so we could bring in some remote attendees as we sat around my livingroom and talked. 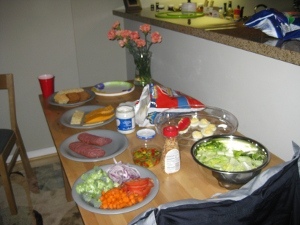 This entry was posted on Friday, May 11th, 2012 at 10:52 am and is filed under events, tech, ubuntu planet, UDS. You can follow any responses to this entry through the RSS 2.0 feed. Both comments and pings are currently closed. Was nice to be able to put faces to the names and voices to the text :). Thank you so much for allowing us to be in your home, even if it was remotely. Why does everyone look so bored/uninterested? Probably just tired :) At the end of day four everyone starts looking a bit ragged! Entries (RSS) and Comments (RSS). 26 queries. 0.088 seconds.